‘Tamdi bhajji’ in Konkani means ‘Red edible plant’. This is referred to as ‘tamdi bhajji’ or ‘moDil bhajji’ (means the ‘edible plant cut into pieces’, I donno how this name has come). 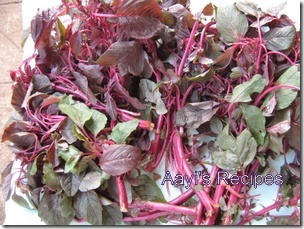 This is very famous at our native, people used to grow it at home, but now it is widely available in markets also. This is widely used in Kerala cusine (LG has given a lot of good information about this bhajji) and called as ‘cheera’. Since I have no idea whether it is a type of spinach or amaranth, I thought of going with the name specified here, here (this is the variety usually available in Bangalore) and here (this is the one loved by all at our native). (According to LG’s post specified above, this is a type of spinach). I have seen this many times in Chinese stores, when I googled, I got to know, this is also called as ‘Chinese spinach’. Among all other dishes with this bhajji, my favourite is this side dish. While cooking this bhajji, do not cover the lid. If it is covered, the red color goes off. Cook black eyed beans in pressure cooker till they become soft(around 1-2 whistles), but they should not be mashed. Cook bhajji in around 2 cups of water (do not close the lid while cooking). Grind coconut with red chillies and tamarind(if using) to a very smooth paste. Add the masala and cooked beans to bhajji, add slightly crushed teppal and kokum pieces(use any one, kokum or tamarind). Add salt and cook till masala becomes slightly thick. Serve as a side dish with rice/chapathi. 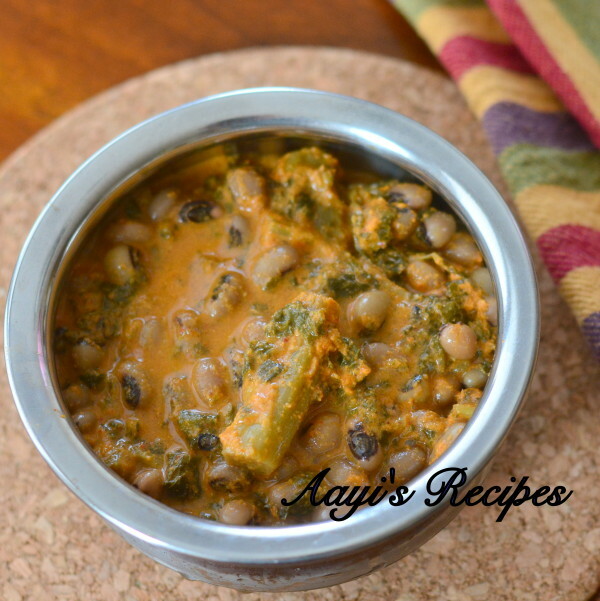 Traditional recipe calls for teppal, but this dish tastes good even if teppal is not used. Hi …. I love this randayi very much. I have not seen tamdi bhajji here. I love making various dishes with it. I did not we add alsande to this. Must try this way. Thanks for sharing. Aruna, there is one more dish, usually used as a gravy where alsande is not added. I will post that recipe soon. Dr. Maam randayi like assile ukdo sheetha barobari. Thank you doctor maam.